Experience intense head-to-head competition with the precision and power of the Nerf Rival Nemesis MXVII-1K blaster. This fully motorised blaster has a high-capacity hopper that holds up to 1 high-impact rounds. Fill the easy-loading hopper and unleash a blistering blast of rounds at a velocity of 1 feet per second (3 meters per second). Go into battle as Team Red. Power it with batteries or the Nerf Rival Rechargeable Battery Pack (batteries not included and battery pack sold separately). Includes 1 high-impact rounds. 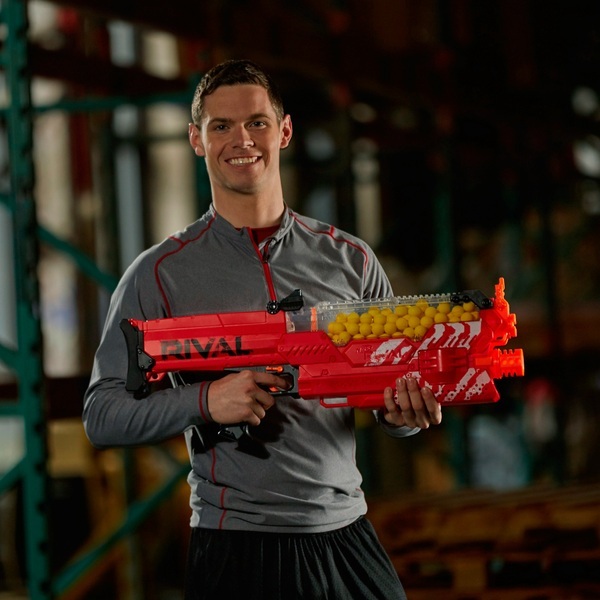 Experience the intensity of Nerf Rival with the Nemesis MXVII-1K blaster! EU Warning: Not suitable for children under the age of 3 years due to small parts which could cause a choking hazard. Use only darts designed for this product. Do not modify darts or dart blaster. For use with Nerf Rival products only.